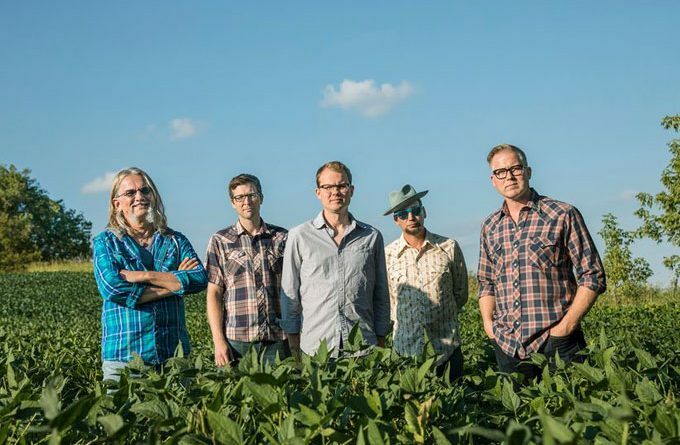 Self-managed, self-produced, and self-recorded band, Six Mile Grove, is comprised of Brandon Sampson (Lead vocals, rhythm guitar, and harmonica), Barry Nelson (Backing vocals, Wurlitzer, Hammond Organ, piano and lead guitar), Dezi Wallace (Bass guitar, banjo, and mandolin), Brian Sampson (Drums and percussion) and John Wheeler (Pedal steel, dobro, accordion). The band, that has released its seventh album, “Million Birds”, have been toiling away at their craft for over twenty years. If you’re like me and have been pretty bored with most of the cloned electronic new releases coming around nowadays, I highly recommend this album. I always acquire more music than I can reasonably listen to because I like to keep a lot of fresh stuff coming in. This album has been in my player constantly for the last few days, it is simply that good. The melodies, playing and songs are crafted with excellence. The songs on this album reminds you powerfully of those impacting and definitive moments in your life where the entire world pivots on the outcome of a small set of decisions, made on any given day, in the most honest and simple way. Simply great unpretentious music that you will connect to and listen to often. The album opens with the multilayered title track “Million Birds”. The song’s opening bars wallow in a moody, melancholic aura before the chorus slides in with glimmering vocal harmonies. The mood steadily builds up on the more incisive beat of “Patrol Cars”. The album quickly reaches its first musical apex on the brilliant Eagles-like, mid-tempo ballad, “Shame on Us”. Soaring vocals, driven guitars and plenty of breathing space makes this atmospheric arrangement standout for miles. 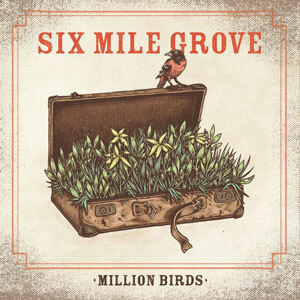 On “Wage a War” and “Early Moring Rain”, Six Mile Grove continue to deliver pure, crystalline melodies and harmonies layered over a shimmering wave of sound. “Not My Fault” transports us into the mundane but critical moments of life, infusing them with a surprising candor that allows and encourages us to embrace those moments, since they’re all we really have. “Shot in the Arm” comes screaming out of the sound system in a bluesy, psychedelic haze of tortured guitars, before the band switches back to an easier alt-folk backdrop on “The Radio”. You can call it alt-country or Americana or country rock, but the labels mean less and less as you go forward on this album. What matters here and always, are good songs, solid performances and a great band vibe, which inhabits both “Money Doesn’t Matter” and “Damned If I Do”. By the time you reach the album closer, the eloquent, “Goodbye to the Loneliness”, you’ll be aware that everything on this recording, just gels into sheer perfection. There’s a breed of longtime Americana-based music fans – and more than a few latecomers who’ve been playing catch-up, sorting through the genre’s essentials, while looking for the best bands to grab hold of, and listen to. All throughout “Million Birds”, Six Mile Grove show that ultimately, after twenty years in the game, what really counts, is the music first and foremost. Now you know where to find them!